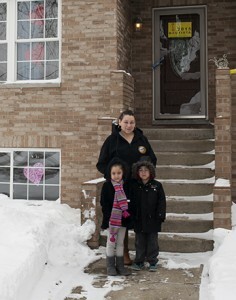 Jessica Loy had lived in her new two-story home for three months when her youngest son, Carlos Gonzalez, Jr., 5, started showing the same symptoms of asthma his twin sister, Carla Gonzalez. Carla has suffered from asthma since she was a baby, Loy said, but Carlos didn’t have a history of the same problems. He’d never needed a nebulizer treatment. Now he does. Now Loy has to convince the energetic kindergartner to sit still for 10 minutes, breathing in vaporized liquid through a small plastic mask, twice every day. Loy believes the answer is where she moved. No one knows for certain how living in the area affects people’s health, but Loy and her neighbors are concerned about petroleum coke. The dusty, black, oil refinery byproduct is stored unenclosed in 30-foot piles at KCBX Terminals, Inc.’s two facilities, the 22-acre North Terminal and 82-acre South Terminal. She and her husband, Carlos Gonzalez, Sr., had bought their first house in Chicago’s East Side neighborhood to be closer to her parents. The spacious two-story home had enough room for her entire family including the twins, their older sister, 6; and Loy’s two teenaged sons from a previous marriage. It was much more affordable than an equivalent home closer to downtown. The house sits just blocks from the South Terminal, which has been operating since 1990. KCBX is a subsidiary of the industrial juggernaut Koch Industries, owned by brothers David and Charles Koch. According to Forbes, the Koch brothers are each worth $41.9 billion and rank as the sixth wealthiest people in the world. For the past two years, a coalition of neighborhood activists has been fighting the Kochs for an outright ban of petroleum coke, commonly referred to as pet coke. In February, the grassroots movement claimed a cascade of small victories, culminating in the announcement that KCBX will cease storing pet coke in the neighborhood by mid-2016. But the site will remain a transfer point as the product moves across the state by truck, rail and barge. At Chicago’s municipal elections five days after the announcement, 86 percent of residents of Chicago’s 10th Ward voted in a non-binding referendum to ban pet coke entirely from Southeast Side neighborhoods. Despite these victories, activists say, the fight is far from over. Residents point to uncertainties about how long the trucks, rail cars or barges could stand at the site and whether they will be open or enclosed. Shepherd said that even after BP stops sending its pet coke to South Deering, current permits allow for the KCBX terminal to handle up to 11 million tons a year of pet coke from the ExxonMobil refinery in Joliet and the Citgo refinery in Lemont. While the jury is out about the health hazards of pet coke, no one disputes that the three-story black piles are ugly, intrusive neighbors. When the wind blows, a peppery dust coats houses, cars and parks. Olga Bautista first started paying attention at a friend’s picnic in August 2013. When the wind kicked up, she said, the hosts had to throw out any uncovered food, which had quickly become studded with granules of the black coke. Bautista, who became involved with the Southeast Side Coalition to Ban Petcoke after her ill-fated picnic, has said emphatically that would not be tolerated in neighborhoods with more clout at City Hall. “Informally, we call ourselves a sacrifice zone,” said Salazar. Environmental justice activists have used the term sacrifice zone to describe areas that shoulder the brunt of environmental degradation. The question remains, however, whether pet coke is a health hazard. KCBX has said no scientific study has proven that the dust is harmful to human health. However, the effects of long-term exposure to fine particulate matter are well documented. The smaller the particulate matter, the more easily it enters the body, getting into the small channels of the lungs. Because of the concern for human health, the U.S. Environmental Protection Agency monitors the air concentration of particulate matter less than 10 microns across—which can be, at its largest, 25 times thinner than a human hair. The EPA began monitoring particulate matter in the air at eight stations along the KCBX fence line in February 2014. On at least 19 days since monitoring began, at least one of the air monitors around KCBX recorded 24-hour average concentrations higher than 101 micrograms per cubic meter. This ranks on the EPA’s Air Quality Index as an orange day, meaning the air is “unhealthy for sensitive groups” including adults with heart or lung conditions, children and the elderly. On three of those 19 days, the particulate matter in the air was high enough to qualify for a red day designation. For comparison, Los Angeles County had seven red days in 2014, according to the American Lung Association’s yearly State of the Air report. Cook County as a whole registered no red days. No long-term studies have been done, but Loy and other residents say their kids are getting ill more frequently. Recurring sinus infections, Cetnar said, are increasingly common because the dust will re-aggravate an infection before it resolves completely. Environmental pollutants don’t cause asthma, but it can be triggered or worsened by allergens such as dust mites or particulate matter in the air. Regardless of whether a person has asthma, living around particulate matter can lead to long-term lung issues, Cetnar explained, because it irritates the microscopic hairs toward the back of your nasal passages. These hairs, along with your mucus membranes, act as barriers against foreign objects entering the body. The Southeast Side, stretching between the shores of the Calumet River and the banks of Lake Michigan, has long been far from Chicago’s power centers, not only geographically but metaphorically. U.S. Steel’s South Works plant, which had employed generations of blue-collar families in the area, closed in 1992. “The steel mills were the lifeblood of the neighborhood,” Cetnar said, and the area has never recovered. South Deering, where the steel mills were located and home of the KCBX North Terminal, now has a per capita income of $14,685 just over half that of the average Chicagoan, and 29 percent of households are below the poverty line. For years, these lots had been home to small amounts of pet coke stored alongside coal, which was trucked to Pilsen and Little Village to be used to fuel the Fisk and Crawford coal-fired power plants in those neighborhoods. When Fisk and Crawford, among the oldest coal-fired power plants in the country, finally closed there in 2012, neighbors thought they might be free of the unsightly piles. “We thought we were going to get a reprieve from something that was a blight on the community,” said Salazar. Her task force continued to fight environmental battles, including a successful campaign against a coal gasification plant. Then, after the windstorm in summer 2013, residents began to sit up and take notice. The community the steel mills had abandoned was left with acres of brown fields: unusable, polluted lots. The community had been “complacent,” according to Shepherd. It’s difficult to mobilize community members who are struggling to make ends meet, who have a history of being marginalized and disconnected from the political process. The community started putting pressure on the City Council to ban pet coke, eventually joining forces with the Natural Resources Defense Council. In September 2014, Beemsterboer Slag Corp. decided to remove the black piles from its terminal on 106th Street and sell the property. In February of this year, the Chicago Department of Public Health denied KCBX its 16-month extension request for building the 1,000-foot-long enclosure the company had planned for completion in December 2016. It seemed the neighborhood was finally gaining ground against the system of heavy industry that had left their neighborhoods polluted and barren. The February 2015 pet coke referendum became a sort of referendum, on the 10th Ward’s 16-year alderman, John Pope. “There was a lot of anger toward the alderman,” the first time Pope met with the community about pet coke, Shepherd said. They didn’t understand, he said, why the alderman had allowed the petroleum refinery byproduct into their neighborhoods at all. Pope had proposed legislation to ban pet coke with 14th Ward Ald. Ed Burke, but the ordinance had stalled in the Finance Committee. The anger continued into the election. Four of Pope’s six challengers, including Bautista, had previously worked with the Southeast Side Coalition to Ban Pet Coke, an umbrella organization for activist groups working on the issue. Opposition candidates accused Pope of accepting contributions from the Koch brothers. According to the Chicago Board of Elections campaign contributions website, Pope hasn’t received money from KCBX since 2008, though he did receive money from Beemsterboer Slag Corp. and Mayor Rahm Emanuel’s political action committee. Pope was forced into an April 7 runoff against first-time candidate Susan Sadlowski Garza, who had the backing of mayoral challenger Jesus “Chuy” Garcia. In the week before the election, the anti-pet coke campaign had won two more victories. BP announced it would stop sending pet coke to KCBX from its refinery in Whiting, Indiana; the primary source of the dust. Shortly after, KCBX said it would close its North Terminal at 100th Street and use the South Terminal, at 112th, as a transit point only. Salazar and others worry the shift in operations won’t solve the issue, since the common understanding is that the rail cars and barges carrying pet coke still will be transported in open containers. “They very cleverly got around that ordinance,” Salazar said. No one knows what the transport process will look like, including how long vehicles will sit uncovered while the pet coke waits for transfer. “I don’t trust them to put people before profits,” Cetnar said. The overwhelming support for the referendum, according to activists, is an unqualified victory. KCBX and BP declined to be interviewed for this story. Pope did not respond to requests for comment before publication.